Volunteer organizations like CircusAID bring lighthearted yoga and mindfulness practices to displaced refugees. CircusAID visiting a group of refugees in Lesvos, Greece. The crisis in Syria affects more than 12 million people. Over a million migrants and refugees entered the European Union in 2015 alone. While many humanitarian relief efforts provide basic needs like water, food and clothing, some organizations like Holistic Circus Therapy and Clowns Without Borders are taking an unconventional, lighter approach, to bring laughter, mindfulness and even yoga to displaced refugees. 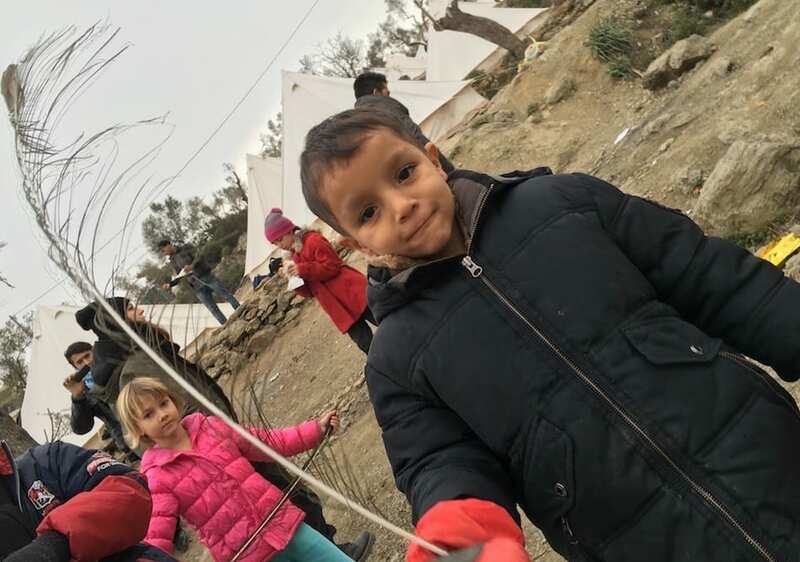 In January, CircusAID was developed as a branch of Holistic Circus Therapy that worked with Syrian, Afghani, and Iraqi refugees in Lesvos, Greece, where thousands of refugees were arriving by boat almost daily. “In Lesvos I encountered joy and laughter while engaging with adults and children using circus,” said Jill Maglio, the founder of Holistic Circus Therapy. “There is a getaway in expressive arts—even if only for a short while, these people experienced respite from their current stress, fears, and uncertainty about what would follow in their asylum seeking journey,” she said. 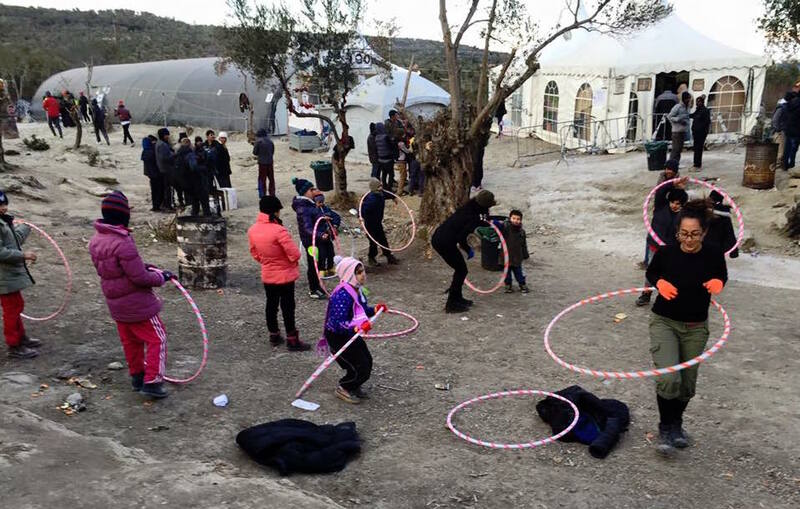 A group of children play with hula hoops in Lesvos. Maglio incorporates circus tricks and activities to enable the displaced to help them re-acquire a sense of identity and self-confidence. It’s certainly not a permanent solution to the millions of lives who’ve lost everything, but a few hours of lighthearted playfulness can help to alleviate some of the stress brought on by the trauma that they’ve endured, and give even the smallest sense of a robbed childhood back. The potential benefits of circus therapy include improved emotional health, reestablishing empathy, leadership and trust, and better cognitive function. Maglio recently told VICE magazine that emotional trauma and lack of basic needs aside, one of the biggest problems refugees face is boredom, which can be detrimental to the brain and lead to atrophy. Some modules include activities like “The Mindfulness of Juggling,” and “The Enlightenment of Silliness,” which include ‘clowning’ and physical movement—like basic yoga poses—to help keep motor skills sharp and promote positive collaboration and togetherness. A child balances a feather in Lesvos. With a master’s degree in occupational therapy, Maglio believes that everyone—no matter what circumstances—needs a balance of self-care, productivity, and leisure time for optimal health and happiness. She realized that the combination of circus arts and occupational therapy were an effective educational and therapeutic tool for distressed individuals and communities. Her first project led her to Cambodia in 2009, where she studied the correlation between social and emotional trauma and environmental conditions, and the positive impact that circus therapy had to help alleviate. She currently works with populations in the New York City area, and is planning to return to Lesvos in the spring. “Although there are few publications in academic literature that look at circus as an effective social and emotional capacity building tool, it is becoming increasingly recognized,” she said.